For a different spin on Valentine’s Day poetry, try this unique idea – have students make a Box o’ Love for a loved family member. Using a covered cereal box, students decorate the box with poetry and pictures, while learning about poetic licence, and increasing their vocabulary. Lesson can be started before all boxes are at school because writing and drawings will be done on white paper, glued to their cereal ‘Box o’ Love’ after they are printed and checked by teacher. Show students a familiar book and introduce terms like “dedication, author’s biography, publisher”. 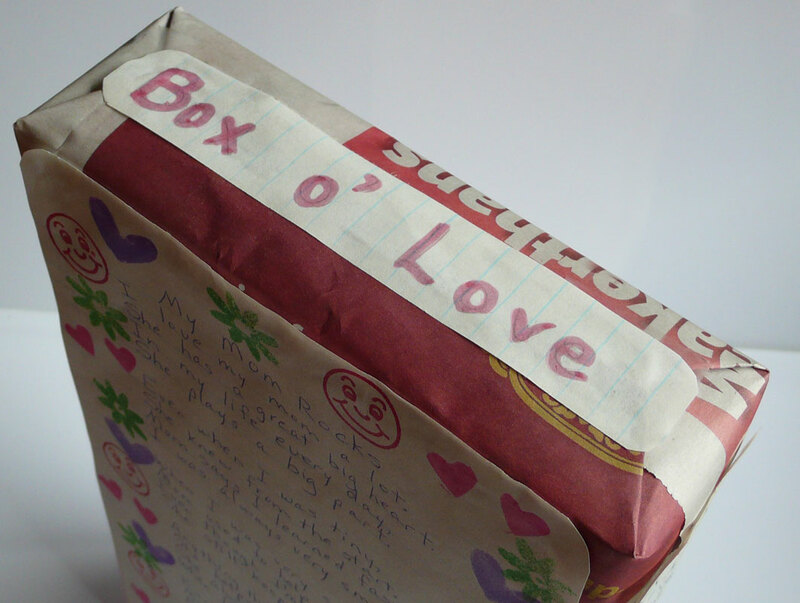 Tell students that they are making a Box o’ Love for somebody in their family whom they love very much. The back of the Box o’ Love is where the love poem will be placed. The rough draft will be written in their journal, and the corrected good copy will be neatly printed on a lined piece of paper, on which the border has been decorated with hearts and cupids, or upon which the student will draw, stamp or decorate appropriately. One of the side panels of the cereal box will be written up as an Author’s Biography. A simple student portrait may be drawn above the narrative if student’s wish. The narrative will be drafted and corrected in their journal, then neatly printed on a lined sheet of paper to fit the side panel of the cereal box. The basic outline may be copied from the chartboard. (Students fill in the blanks with their information.) See below for Author’s Biography which students will copy and fill in. The other side panel of the cereal box will be the dedication, and the publishing date (February 14, 2011), and the publisher’s address (student’s address). 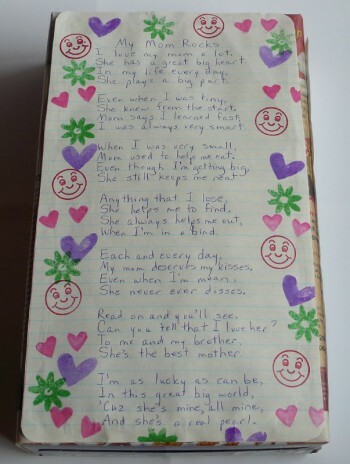 It might read: “My Mom Rocks” is dedicated to my wonderful mom, Janet. It was published on February 14, 2011. The publisher’s address is 3924 Main Street, Springfield, USA, 83324. Brainstorm a list of rhyming words student’s could use for their poetry. See examples below under Valentine Rhymes. TOM SMITH is the bestselling author of “My Mom Rocks”, his/her latest poetic endeavor, written to extol the many virtues of his/her wonderful mother/father/aunt/uncle/grandma/grandpa/step-mom/step-dad. Tom was born in Springfield, USA and is a full-time student at XYZ School of Excellence. In his/her spare time, he/she loves to play soccer and video games. He/She has a mom and step-dad, and three younger brothers, Justin, Sidney, and Alex. When he/she graduates, Tom is planning on working full-time as a professional hockey player.